Home » Uncategorized » The Korean Mata Hari: Kim Soo-Im? The Korean Mata Hari: Kim Soo-Im? For those that don’t know, Seoul changed hands 4 times during the Korean War. Ronald Reagan? He was already mixing it up with the Communists in the early 1950’s. “Kim Soo–im and her love triangle are gone, buried in separate corners of a turbulent past. But in yellowing U.S. military files stamped “SECRET,” hibernating through a long winter of Cold War, the truth survived. Now it has emerged, a half-century too late to save her. 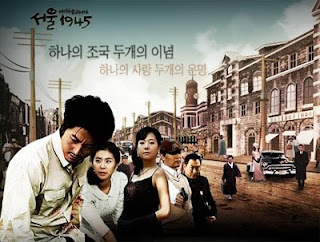 The picture itself is not Kim Soo–Im, but rather a TV drama I only recently discovered called Seoul 1945. Looks good in an incredibly predictable, airbrushed sort of way. Not to be too sarcastic or anything, but I wonder if the woman in the black dress is the rich villian?